1. Elizabeth WHICHCOT, daughter of Colonel George WHICHCOT MP, of Harpswell (1653-c. 1720) and Frances MERES (1669-1733), was born on [Julian] 24 February 1705. She was baptised on [Julian] 20 March 1705 in Harpswell. 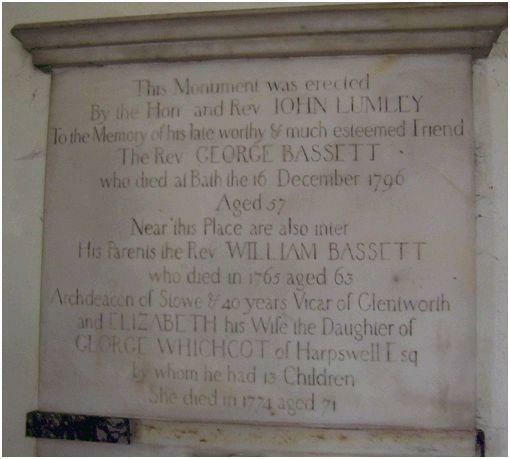 She married William BASSETT on [Julian] 19 February 1729 in Glentworth, Lincs.. She died circa [Julian] 14 February 1774. She was buried on [Julian] 19 February 1774 in Glentworth. Richard BASSETT (1744-1805). Richard was born on 15 September 1744 in Glentworth. He was a Gentleman, Soldier. He married Martha ARMITAGE on 1 July 1774. He died on 12 July 1805 in Glentworth. He was buried on 17 July 1805 in Glentworth.